- 2c) See Windows 10 update history at support.microsoft.com for the most recent Version (1703 as of this post) and Build (15063.###) which offers links to the Microsoft Update Catalog for download (Windows Update is the preferred method). 4) Type "Settings" in Cortana and System > Storage > "Choose where new content is saved" to confirm the drive where you will install the 23 GB demo. "during the summer" could be anything up to late September which is about the time demos are usually released. I wouldn't expect it any sooner. Is September summer for you guys? Would be classed as Autumn here. September is Spring for me. Summer doesnt start until Dec for AU. I mean, Apex is still free and has a really good engine that was likely used for FM7. Worth the time, easily. Precisely - they typically release demos almost right up until the release, so about 3-5 weeks prior to the release date is when we should be seeing it. The Autumnal Equinox is the same date for the entire Northern Hemisphere. even though the equinoxes happen at the same time, the climate is different the further north or south from the equator you are. so some places have their seasons set by the climate and not the equinoxes, thus why September could be mid autumn for some places. Not to mention that it's filled to the brim with content especially if you pay the $17 or whatever it costs. I'm a PC player and was so excited when I heard the game was coming out. Luckily I heard about it the day before release so I bought it and it was incredible. I never got the chance to play Forza before and it was really incredible to finally be able to play. Since then I've put over 400 hours into the game, I'm level 901, I've 100%'d the base game and all DLC's, and I've made hundreds of designs and liveries and I just became a Legend Painter. It really was an awesome experience. Then I realized that they had Apex which was a tech demo. I downloaded it and the more I played it, the more I realized that this is where Forza shines. C class is a lot of fun. Coming from Assetto Corsa I was looking for something a bit more laid back that I could play with a control. Forza Motorsport is just amazing. It really makes you appreciate the cars a lot more and RWD is incredible. I only really used it for drifting in FH3. VERY excited for our first full motorsport game. I've already preordered the ultimate edition. Let's hope for a preload! I'm hoping for a demo at PAX. You guys are too funny... Regardless of when the summer solstice or equinox, or whether we are observing the Gregorian, Julian, or Mayan calendars, or any of that business, I wouldn't expect a demo before September. 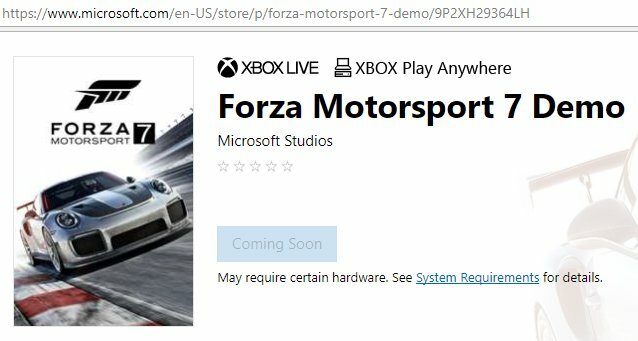 The demo for Forza 6 dropped on September 1, 2015, two weeks before the official release date. If T10 are consistent with this. the demo for FM7 could come out Monday/Tuesday September 18/19. I'd like to see it sooner but that's the pattern. Despite what the experts say, my summer is from April - late October and sometimes November. I guess you could say winter is a hybrid autumn with a few weeks here and there of cold. Got to love global warming. It's a real thing. As for the Forza Motorsport 7 demo, expect to see one in mid September. Expect Turn 10 to announce such a demo in early September. err? as an Aussie you have that wrong. "An equinox is the moment in which the plane of Earth's equator passes through the center of the Sun's disk, which occurs twice each year, around 20 March and 23 September"
"In the Northern Hemisphere, the fall equinox marks the first day of fall, There's also another, more common definition of when the seasons start, namely meteorological definitions, which are based on average temperatures rather than astronomical events." Doesn't matter what your country says, its technically astronomical. Lets go by the US date of fall since Turn 10 is headquartered here in the US. FH3 and FM6 demos dropped two weeks before their games' general release. Given FM7's October 2nd release date I'd expect a demo to drop around Sept. 18th if they stick to the same timing schedule. We'll just have to wait and see. It would be so much easier if gaming companies stoped saying it will be released in early summer or late winter, just stop using the seasons and just let gamers know it will be in Late December or what ever part of the month they choose, that way they will no longer be ignoring or just plain forgeting about all the loyal gamers on the other side of the Equator.